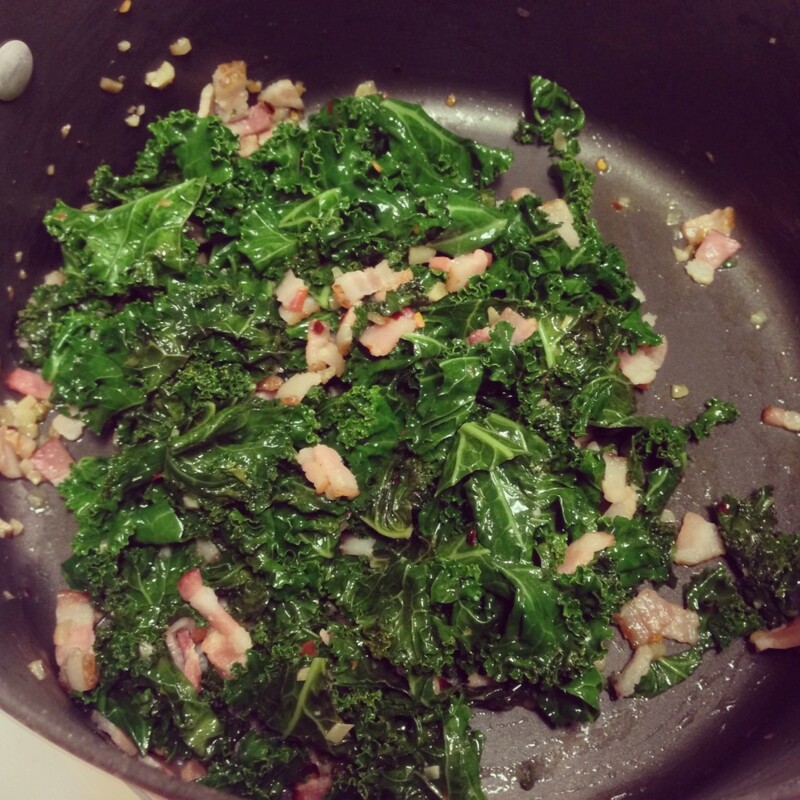 This kale recipe with bacon has made me fall in love with kale. I used to buy kale solely for putting in my smoothies. Then I made butternut squash and kale lasagna (recipe coming soon). Now I cannot stop making this bacon kale goodness. I may have been guilty of making fun of people who are obsessed with kale in the past. I am not going to be making kale chips to substitute for unhealthy full fat potato chips anytime soon though. This recipe comes in at 450 calories for one quarter of the pizza. I think this is a miracle considering the delicious dough and perfectly melty cheese. Serve this pizza with Gewürztraminer, an Italian style (usually called traminer) if you can find it. This is a very distinct wine with off dry, floral notes that complement the spiciness of the kale. This wine pairs well with most spicy foods. In a large stock pot, heat olive oil over medium heat. Add in the bacon. 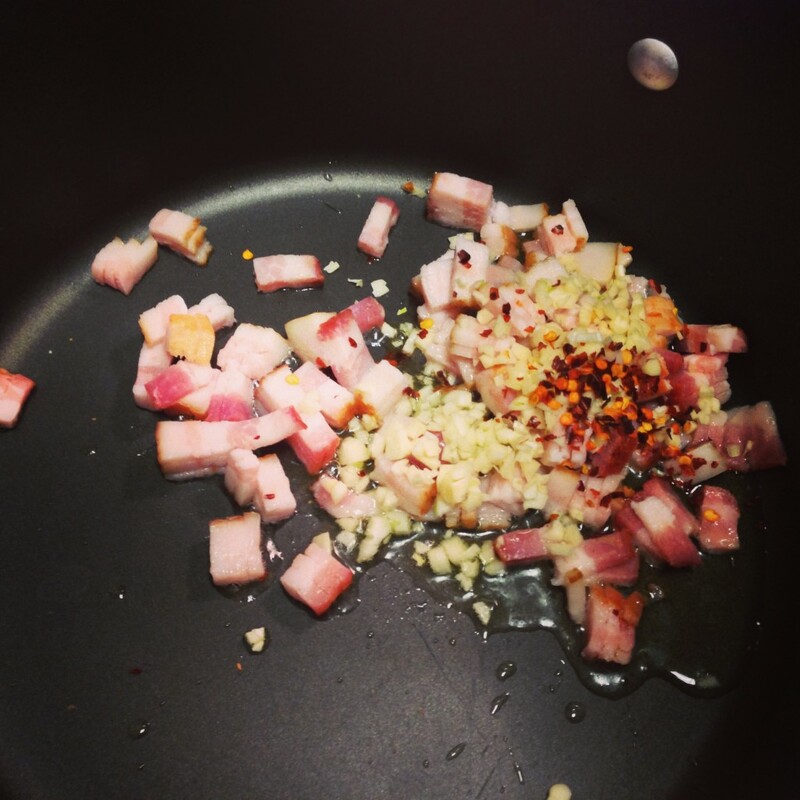 Saute the bacon until it renders some of the fat, about 6 minutes, until it is brown but still soft. Mix in the garlic and red pepper flakes, cook 1 minute. Add in the kale and cover with a lid. Cook for 5 minutes and then remove the lid. Saute for 5 minutes more or until the kale is firm tender. Preheat oven with pizza stone in place to 450 degrees. Roll out the pizza dough between two sheets of oiled parchment. It should be about 12 inches in diameter or 1/4 inch thickness. 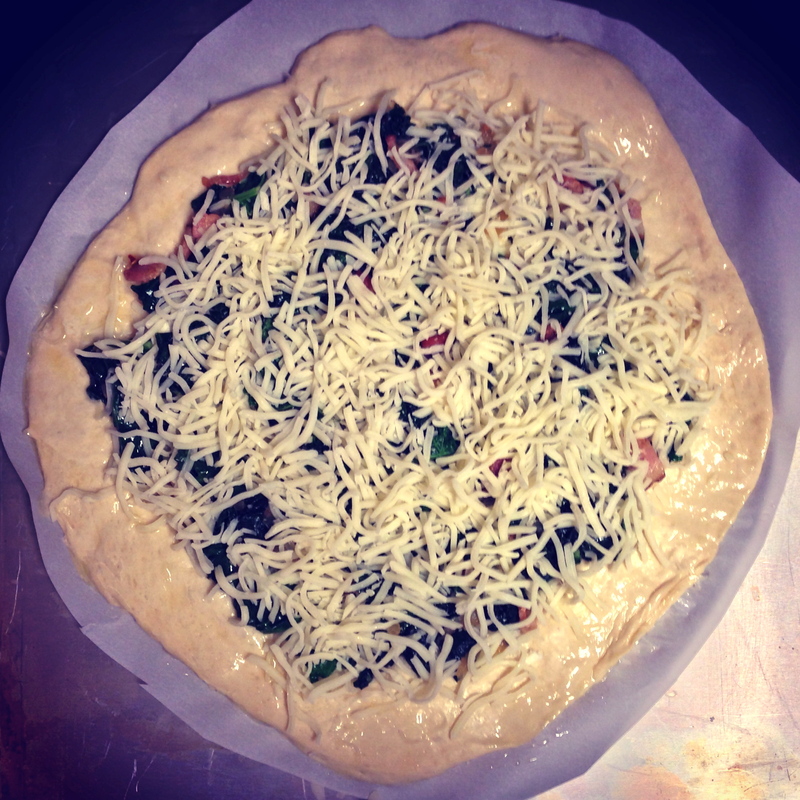 Distribute the ricotta by the spoonful over the pizza dough, leaving a 1 inch border. Spread the cooked greens and bacon over the ricotta. Sprinkle with mozzarella and parmesan cheeses. Brush butter on the exposed edges of the pizza dough. Bake for 10 minutes or until the crust is browning. Throughout my bread baking journey, there have been some less than ideal products. 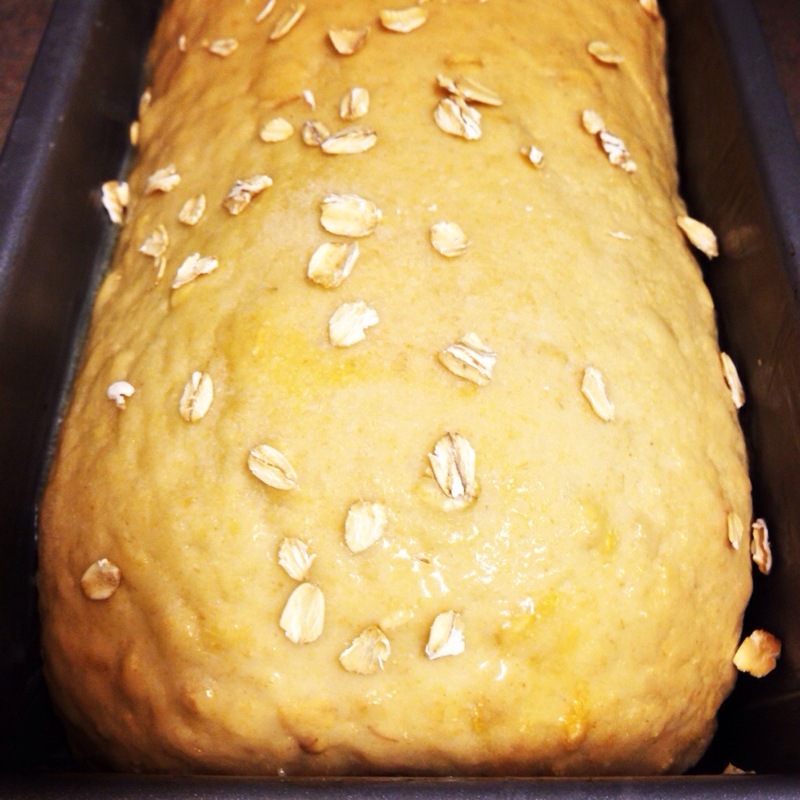 The other day when I was post call, I doubled the honey oat bread recipe to make two loaves. The dough rose beautifully and was absolutely perfect. I formed them in the pans and left them for a second rise…. And then fell asleep for 3 hours. Don’t over rise your bread in the pans. The top of the loaf will dry out and collapse. Also, maybe don’t bake bread after working 30 hours straight. I baked the loaves anyway and I burned them of course. But as it turns out this was not a complete failure. I turned this bread into croutons. Just trim off the overly baked edges and it’s like you never messed up your perfect dough. Homemade croutons are insanely good and there are so many different ways to flavor them. You can use any loaf of bread for this. It is a great way to use up homemade bread that is dry and a few days old. Put these croutons in salads or serve them with soup, like this French Onion Soup. Cut them into whatever size you prefer. Sprinkle these croutons with Parmesan cheese halfway through baking, or my secret salad improver – the Melting Pot Garlic and Wine seasoning. Preheat the oven to 350 degrees. 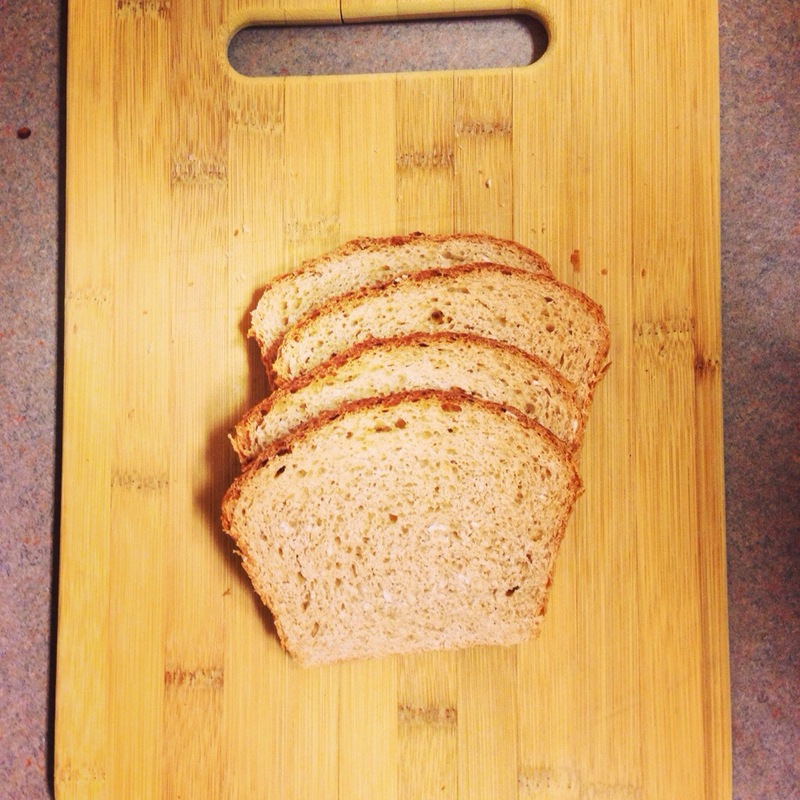 Cut the loaf of bread into one inch slices, cutting off the crusts if you prefer. Cut this into one inch cubes, or larger strips for soup if you prefer. In a large bowl, toss the bread with just enough olive oil or melted butter to coat them. Do not saturate the bread. Arrange the bread in a single layer on a large baking sheet lined with aluminum foil. Sprinkle generously with salt and pepper, and any seasonings of your choice such as garlic and onion powder. Bake at 350 degrees for 20 minutes, rotating the pan halfway through, until they are golden brown. 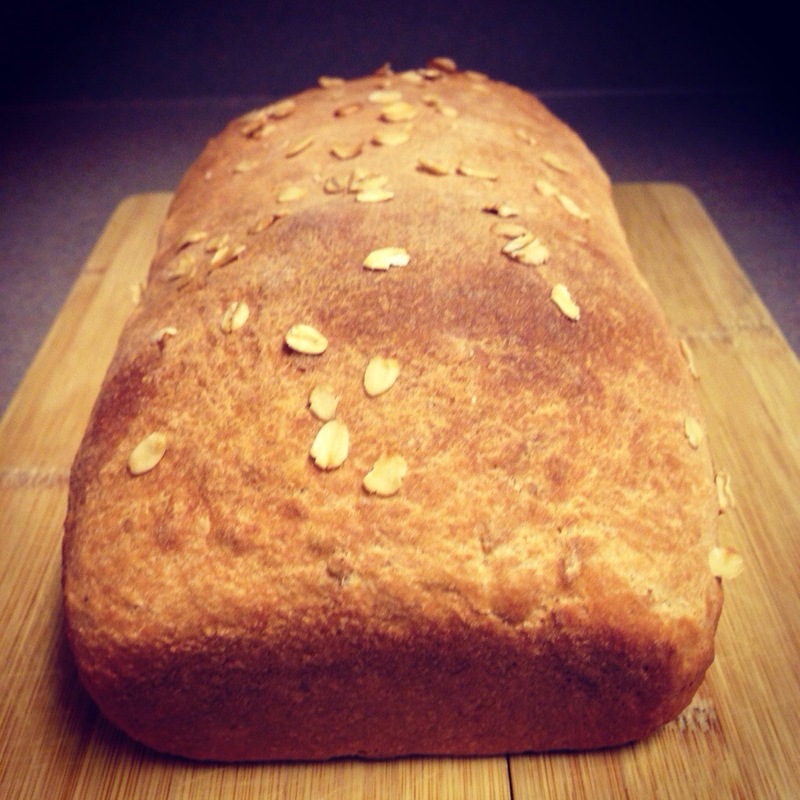 After much experimenting and many tiny barely risen loaves of bread… I am elated to post this honey oat bread! It is my new favorite. It is fabulous for sandwiches and toast. It is very difficult not to eat it piece by piece while it is still warm from the oven. I actually really like this method of melting everything together in a saucepan as well. You can bring the liquid to an exact temperature and get a more consistent rise from the dough. I have to say, this bread baking journey has been so rewarding. It has not been difficult, even during my busiest of weeks. There is something therapeutic about baking the same thing each week. A note on the flours… You can use all-purpose flour if you do not have bread flour. I have used it in this recipe and the bread was still delicious. I have also experimented with using whole wheat flour instead of white whole wheat. You should experiment with proportions of white whole wheat to whole wheat flour. This changes the texture of the bread and this is really a matter of personal preference. Readers have asked me about gluten free bread. I don’t know why gluten has become such an evil substance. There are people with real gluten intolerance who have a long list of symptoms and suffering. But I am not sold that gluten free food is “healthier.” If you do have a gluten allergy, I would recommend Thomas Keller’s Cup 4 Cup flour substitute. If there is one person to be trusted when it comes to recipe substitutions, it has to be Thomas Keller. In his books he allows no substitutions and is extremely precise. In a small saucepan over medium-low heat, stir together the water, butter, and honey. Allow this to melt together and warm to 140 degrees. In the bowl of a stand mixer fitted with a dough hook, combine 2 1/2 cups of the flour, kosher salt, oats, and yeast. Pour the water/honey/butter into the flour in the stand mixer bowl. Mix on speed 2 for a minute until combined. Add in the egg, mix for 1 minute. Turn the mixer on speed 2 and knead for 5 minutes, adding the last half cup of flour intermittently during the kneading time. Place the dough in a well buttered bowl and cover with parchment and a towel. Allow to rise in a warm place for 1 hour, it should double in size. Remove the dough from the bowl and roll out into a rectangle. Fold into thirds starting with the short sides, then the long sides. Roll the dough out again and repeat. Turn it over and place the dough seam side down in a 1lb loaf pan. You should have a nice and smooth top surface. Allow this to rise for 1 more hour. Bake at 375 degrees for 30 minutes, rotating the pan halfway through. I have been wanting to make a white lasagna for some time now. When I saw the combination of butternut squash and kale, I could not make this recipe fast enough. The first time I made this, I was skeptical about the butternut squash filling. I have now spiced this up a bit because it was kind of bland. Be generous with the salt and pepper. If you under season the squash, the flavor will fade away. Warning: Do not eat all the kale before you make the lasagna! 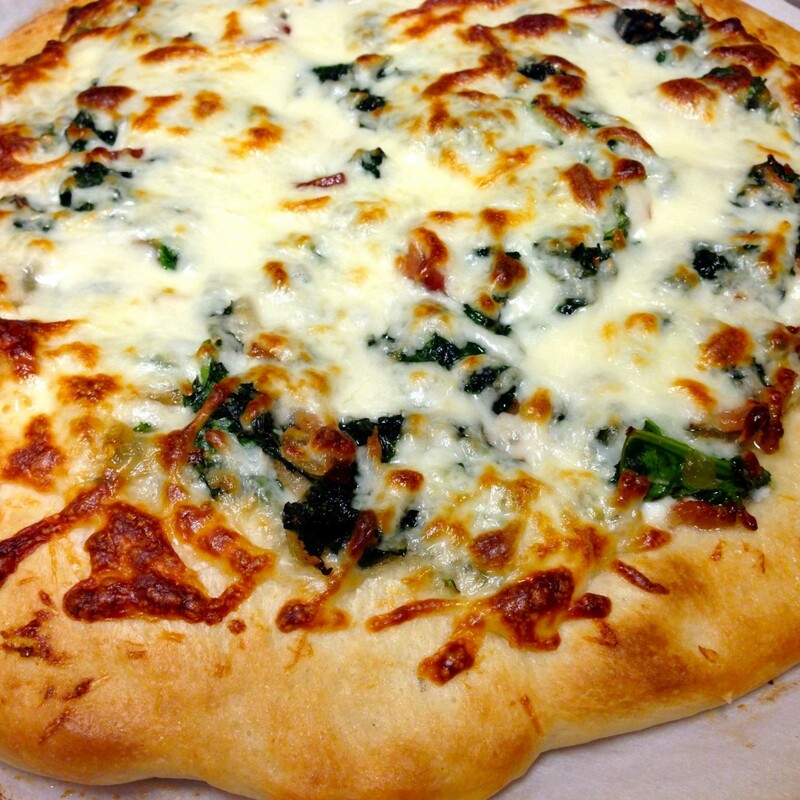 If you have not made this kale before (a la Spicy Kale Pizza), you will be floored by how delicious it is. Keep an eye on your kitchen helpers as well, they will be eating this kale out of the pan. This can be stored just like the Lasagna with Turkey Sausage Bolognese. You can cut this into servings and freeze them. Serve this with a fancier chardonnay. I like Chateau de la Greffiere Chardonnay from Burgundy, France. It is amazing, a little pricier than your every day bottle of wine, but worth it! It is smooth and oaky and complements the spicy richness of this lasagna. 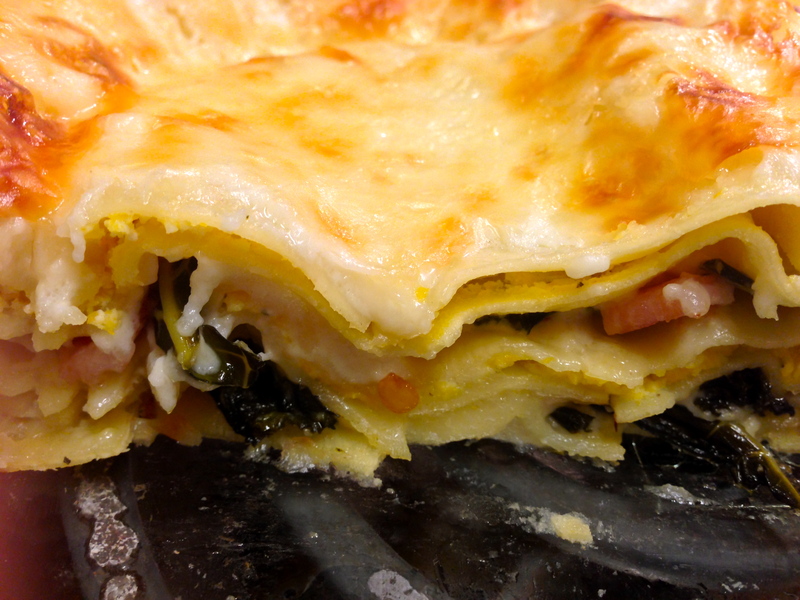 Butternut Squash and Kale Lasagna. 1 medium butternut squash, halved lengthwise, seeds removed. Preheat oven to 375 degrees. Place squash cut side down in a 13 x 9 inch pan. Add water until 1/4 inch the way up the sides of the pan. Bake squash for 35 minutes, until it is easily scooped out with a fork. It should be peeling away from the skin. 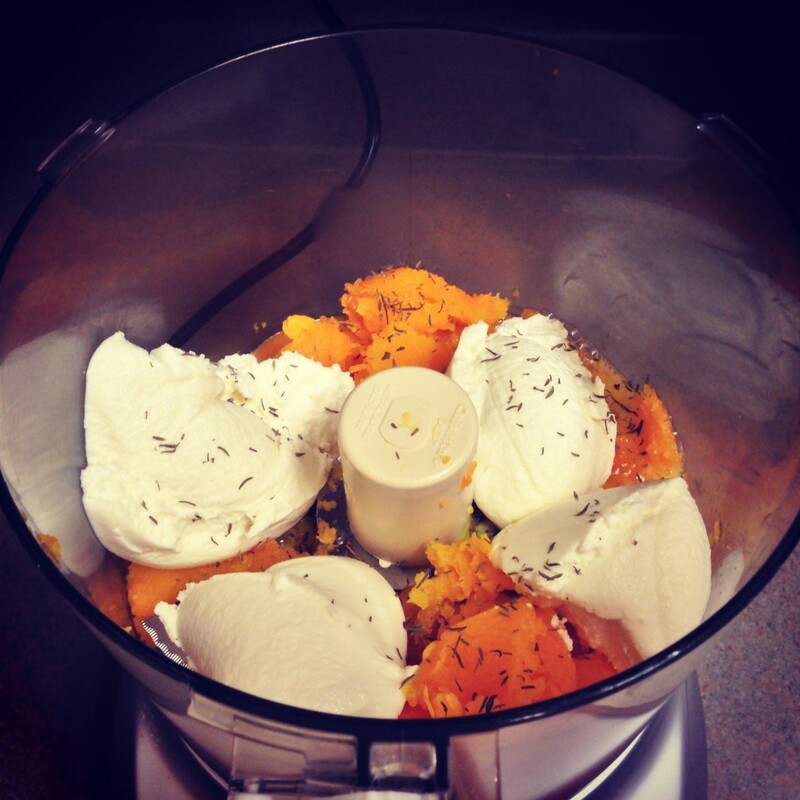 Scoop all the squash out with a spoon (there should be 2 cups) and place into the bowl of a food processor. Pulse until the squash is smooth. Stir in the ricotta, eggs, thyme, and sriracha. Season with salt and pepper. While the squash is baking, heat the olive oil in a large pot or dutch oven on medium heat. Add the bacon and saute until it has rendered some fat but is still soft, 5 minutes. Add the kale and cover the pot, cook for 5 minutes. Remove the lid, stir, and continue cooking for 10 minutes. While you make the sauce, soak the oven ready noodles in hot water for 30 minutes. Heat milk in a saucepan over medium low heat. Clean out the dutch oven with a paper towel. Over medium heat, melt the butter. When the butter is melted, add in the flour. Cook, stirring constantly, until thickened and bubbly, approximately 5 minutes. Add the hot milk, one cup at a time, whisking constantly. Simmer until thick and bubbly, about 7 minutes. Remove from heat, add in the parmesan cheese and nutmeg. Season to taste with salt and pepper. Preheat oven to 375 degrees. Add 1/4 of the bechamel sauce to the bottom of a 13×9 inch pain. Add one layer of noodles. Spread half the kale evenly over the noodles. Add another 1/4 bechamel sauce. Top with another layer of noodles and spread half the squash filling over, smoothing with the back of a spoon. Add another layer of noodles. Add the remaining kale and cover with another 1/4 of the bechamel sauce. Top with another layer of noodles and remaining squash. Add on the final layer of noodles. Spread the rest of the bechamel sauce. Sprinkle 1/4 cup parmesan cheese over the top. Cover tightly with aluminum foil. Bake at 375 degrees for 25 minutes, remove the foil and rotate the pan, bake another 20 minutes. Allow to sit for 15 minutes before serving. I have recently been reading the novel, The Widow Clicquot: The Story of a Champagne Empire and the Woman Who Ruled It and learning so much about the history of champagne. This fascinating book provides a personal look into the creation of one of the most popular champagnes, Veuve Cliquot. There is an untrue rumor that Dom Perignon invented champagne. The credit actually goes to monks in the Abbey Saint Hilaire. They created Blanquette de Limoux in the early 1500s, long before the Champagne region was defined. 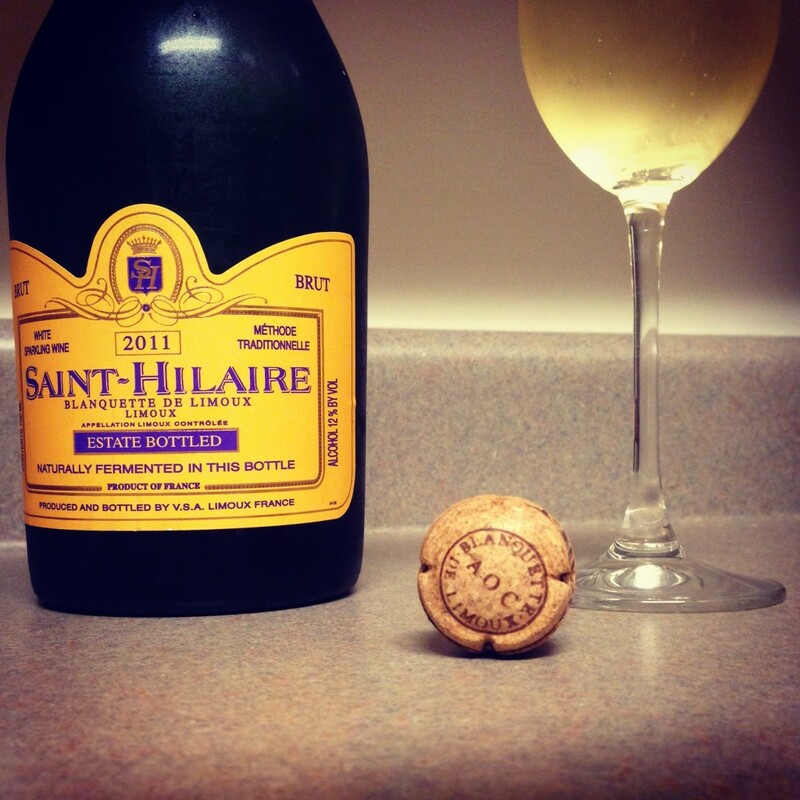 You can buy Saint Hilaire Blanquette de Limoux today in many stores. If you have not tried it, you should. This sparkling is made from Mauzac grapes which have a characteristic green apple flavor. It is a truly wonderful wine, rich in flavor and history, it is also very affordable. For the most part, bubbles that formed in wine bottles were considered a bad thing. Bottles would explode from the carbonation if primary fermentation was not complete prior to bottling the wine. Champagne came into style in the 17th century, associated with luxury and royalty. French Kings were anointed in Reims, where champagne was served during the coronation. The climate in Champagne is actually not the most suitable for growing grapes for wine. The grapes are fickle and difficult to ripen. This rough climate produces these lighter bodied wines with high acidity. The thing about champagne is, there are a lot of rules. There is literally a government committee in a France to regulate anything and everything when it comes to champagne. In fact the use of the term champagne is restricted by the Treaty of Madrid and the Treaty of Versailles. The US was actually not under those regulations and allowed to use the word champagne until recently. It obviously must be made in the traditional method, or méthode champenoise. Champagne is usually made from 3 particular grapes but others are approved. Pinot noir, chardonnay, and petit meunière are typically all used to make champagne. Blanc de Blancs however is made solely from white grapes (Chardonnay). Blanc de Noirs is made from red grapes (Pinot noir and petit meunière). The wines are not red though because the wine is not left in contact with the skins of the grapes. The rules require a minimum of one and half years of aging per the Appellation d’Origine Controllée. AOC is basically a certification granted to certain regions of France to produce certain things. Some years if there is a particularly good harvest the AOC will call this a millesemé. This must age for at least three years. Most champagne that you drink will be labeled NV or non-vintage. They are blends of multiple grapes from different years. To label a champagne a vintage wine, it must be 85% the grapes of that particular year. Author ChelseaPosted on March 10, 2014 February 11, 2014 Categories sparkling wine1 Comment on Champagne, a history lesson.